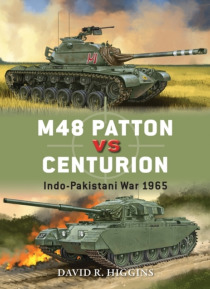 The Indo-Pakistani War of 1965 witnessed some of the largest tank battles since World War II, notably between India's British-made Centurion Mk 7s and the American-made M48 Pattons fielded by Pakistan. The two countries' tank regiments, many of which shared a proud legacy in the British Indian Army, fought one another in the difficult terrain of Jammu and Kashmir, the focus of a long-running dispu… te between India and Pakistan. The armoured clashes at Asal Uttar, Chawinda and Phillora would demonstrate that the Centurion, with its powerful gun and lower profile, generally proved superior to the faster, lighter but overly complex Patton. Featuring full-colour artwork, expert analysis and archive photographs, this is the full story of the clash between two leading tanks of the Cold War era that were never designed to fight each other, but rather to line up on battlefields as allies.